Regardless of a home buyer’s budget, don’t most of us want to feel a sense of luxury at some level when we arrive home after a long day? As important as the practical stuff, when we are searching for our next home to purchase, we are looking for a sense of possibility. 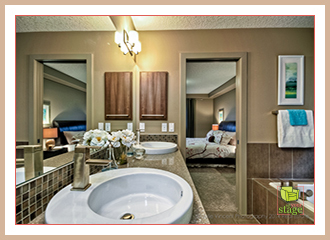 That perception of cozy luxury can be achieved through professional home staging. And it doesn’t have to come at a luxury expense! In my work as a professional stager in Calgary, I combine colour and texture to bring together a space that oozes cozy luxury in a way that appeals to potential buyers in my clients’ neighbourhood. 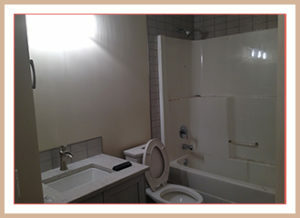 Before: Bathroom before professional home staging. After: This master ensuite looks & feels like a spa. Often it involves bringing in staging rental options like furniture, art, and accessories. But I can also work with what the sellers already have. That flexibility allows my clients to create a sense of cozy luxury without the expense of having to purchase all the necessary pieces themselves. In this updated Kelvin Grove home we staged in Calgary for example, the living room after staging feels like being wrapped in a gorgeous cashmere sweater. It’s not flashy and untouchable. Instead, the room calmly blends together to feel like cozy luxury in a very useable space that potential buyers can feel proud to share with friends and family. Before: Living room before professional home staging. After: The inviting & spacious living room enjoys lots of natural light & warmth of the beautiful feature fireplace. There’s added sparkle through the metal and glass tables and metallic finished lamps. There’s the combination of silky, smooth, nubbly, and shag textures. There are hints of colour through art. Within a relatively monotone backdrop, all these colours and textures meld together to speak quality to buyers. Want to see more examples of cozy luxury? 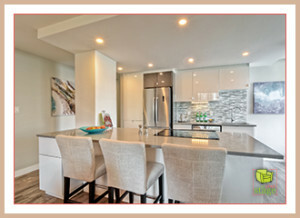 Check out the Set Your Stage Facebook albums to view before and after photos of the various homes and condos that we’ve successfully staged to sell. Let our experienced team help you stage the ideal room possibilities for your buyers when it’s time to sell your Calgary property! You may be the type of person who avoids commitment when hanging art on your walls. Maybe you don’t like all those holes! But when it comes to staging your home to appeal to buyers, I say choosing to hang art in key rooms is a MUST DO when it’s time to sell. 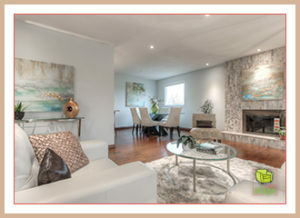 As a Calgary home staging professional, it’s no secret that I love adding art strategically to my staged properties. I’ve written before about how to use artwork for house selling so that you can highlight features or add life to a room. 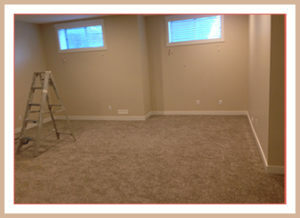 Before: Bonus room before professional home staging. After: Adding furniture, art and accessories to this bonus space help buyers invision living here. In this space you could unwind after a long day and enjoy TV. And plenty of inspiration can be found in our “after staging” photos on the Set Your Stage Facebook page. But if you still have questions about how to actually hang art, look to Pinterest. How high? In what arrangement? Check out our Home Staging Tips board to get the details. For staging purposes, I prefer the simplicity of the anchor approach, which you will see in many of our staged room photos. It creates an important grounding and balancing effect, both in the listing photos and when the potential buyers walk through for a personal viewing. 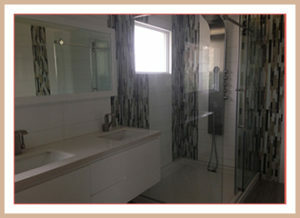 After: Beautiful modern bathroom dressed up with accessories. When you hang art to stage with a purpose, you have the power to influence. The combination of your selected staging furniture, art, and accessories will come together to create the mood and image that you know will speak to your right buyers. If it’s time to sell, hang art to create a lasting impression. 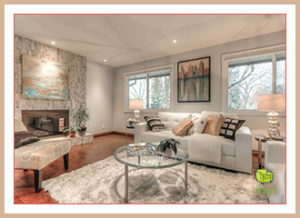 Better yet, get some help from a professional home stager with experience staging properties in your neighbourhood. For more inspiration and home staging tips, check out Set Your Stage on Pinterest. As another year of staging Calgary properties to sell wraps up, the Set Your Stage team likes to tie it up in a bow with a roundup post for our readers. So here they are in case you missed them; six of our most popular staging tips, questions and resources enjoyed by realtors and home sellers in 2016. After: This kitchen is the perfect space to entertain friends on a Friday night. 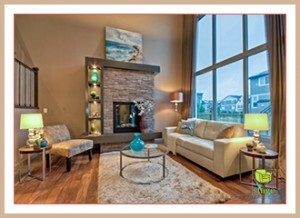 Home Staging Quiz – Does your house or condo need staging before it gets listed for sale? This quick Set Your Stage quiz will help guide you. Stage a Condo with THIS in Mind – Size matters! Calgary Investors: Is it time to sell your rental property? – Get the most for your investment. Selling a Property? Stage for Potential Buyers – It’s not about you anymore. 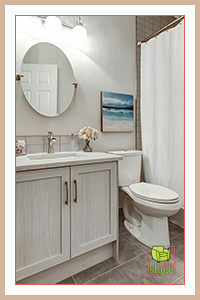 How to Stage a Bathroom to SELL – Small but important, the topic of bathroom staging continues to be popular among readers. Looking Like a Motivated Seller is an EXPENSIVE Mistake – OK, this is from the archives but it still remained a hot topic in 2016 and is one of my personal favourites! 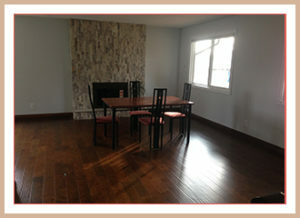 After: This open concept living room is the perfect space for entertaining or relaxing. 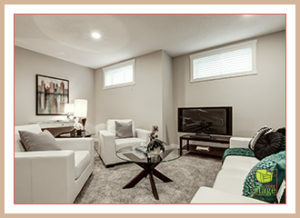 Staging Calgary properties continues to be a popular choice for both real estate agents and home owners. That’s because making the investment to showcase a stunning listing that appeals to your buyers is worth it. These six posts will help get you started. But there’s plenty more support available from our eco-friendly team of professional home stagers. Just ask Set Your Stage in Calgary! After: Adding the white towels and artwork as well as the glass soap pumps and mini plant make this master bathroom feel like a spa. 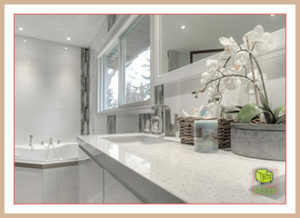 Want more tips for staging Calgary properties to sell? Stay in touch. Follow Set Your Stage on Twitter. You are currently browsing the Set Your Stage weblog archives for January, 2017.